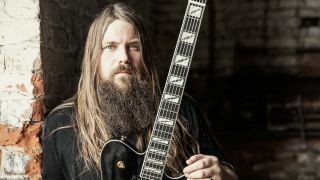 “I feel just grateful and really thankful to have had the opportunity,” says Lamb Of God guitarist Mark Morton, on collaborating with Linkin Park singer Chester Bennington. As fate would have it, the recordings for his debut solo album’s opening track, Cross Off, would be Bennington’s last - his untimely passing coming only months after the sessions. Looking back now, it’s only natural for the guitarist to feel a mixture of emotions - amid all the sadness surrounding such a tragic loss, there’s also a debt of gratitude. The creative venture spawned a lead single that would see the voice of a legend rise to the top of the rock charts from beyond the grave. “Mainly he was super-humble,” says Morton. “No attitude at all walking through that door. He came in very much as another writer for this track, staying really engaged and fun to work with. “My main acoustic is my Guild D-55,” continues Morton. “I strum that all the time and I wrote a lot of this stuff on that. There was a 10th anniversary Jackson Dominion we did a while back; that’s one of my favourites, too – something I’ll play commonly around the house. “I guess one of the things I look for first and foremost when writing is some kind of groove. It’s not about playing as fast as you can, but assessing what kind of pulse you want this riff to have. I tend to like ones that make your head bob or bring this visceral reaction. Give it groove and swagger so that it has personality. “There’s no real secret to making it technical; just think about what kind of characteristics you want it to have... some can be brutish and some can be delicate. It all comes down to the response you naturally get from it. “I think it was the era when I started learning guitar… you had Testament with The New Order, Practice What You Preach and Souls Of Black, then Metallica around Ride The Lightning, Puppets or ...And Justice For All. All these bands in their original heyday, exploring a lot of triplets! “Listening to music outside of metal is actually what’s helpful. When I write for Lamb Of God, I have nothing to gain from listening to metal of the same ilk as the band I’m in. “I won’t ride around listening to Pantera, Slayer or Meshuggah albums to get ideas, because then I’ll just wind up writing stuff that sounds like them. I love bands like QOTSA or early Muse to get songwriting ideas. Those other styles can find their way into whatever I’m doing in that metal context. “Dimebag was always a big influence in that regard. And [Def Leppard/ex-Dio guitarist] Vivian Campbell, too - he’s a blues guy with a very metal history. Zakk Wylde is another - for me, him and Dime were always the ultimate bluesy shredders. “I have learned over the years that less gain and cleaner tends to feel heavier sonically. Even the Black Album, a really heavy album for its time, doesn’t have super-distorted guitar tones. I have learned through experience that dialling the gain back for cleaner tones, especially if you double up guitars in the studio, seems to have more mass and a broader spectrum. “If you rely on any piece of gear to execute your part, you probably aren’t playing it well. If you can’t play your lead without a certain pedal or setting or whatever, you should probably practise it a bit more. We all need gain and sustain to a certain degree, I get it, but sometimes people get a little too caught up in all that stuff. It’s important to remember the sound is mainly in your hands and in your guitar. “I feel like each amp has its own attitude and personality. You could put five Mesa/Boogie Mark Vs in front of me and they’ll all sound like a Mark V, but there will be different idiosyncrasies to how each sounds. You need to dial your amp to the room. Anesthetic is out now via WPP Records/Spinefarm.